In the episode of the television series Taxi in which Jim Ignatowski is hired as a driver for the Sunshine Cab Company, the first scene takes place in Mario’s, the cabbie hangout. The core group of drivers on the show are there to celebrate the fact that one of them, Tony Banta, has finally won a prize fight. Their excitement isn’t dampened at all by the fact that Tony won by default when his opponent fell while climbing through the ropes and knocked himself out. After all, Tony argued, he had to make it through the same ropes. In that scene, one gets a fleeting glimpse of a framed print among the clutter behind the restaurant bar. 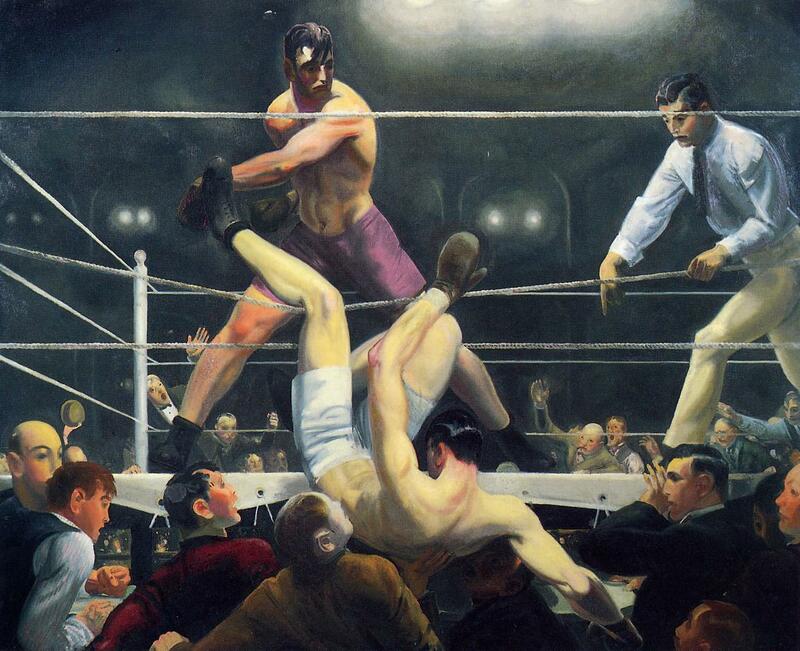 It is a reproduction of Dempsey and Firpo, the 1924 painting by George Bellows. The painting portrays the incident a year before when 80,000 people were admitted to the Polo Grounds in Upper Manhattan—the baseball park had a capacity of 55,000— to watch Jack Dempsey defend his world heavyweight boxing title against the popular Argentinian Luis Firpo. The fight lasted only into the second round, and both men took their licks. 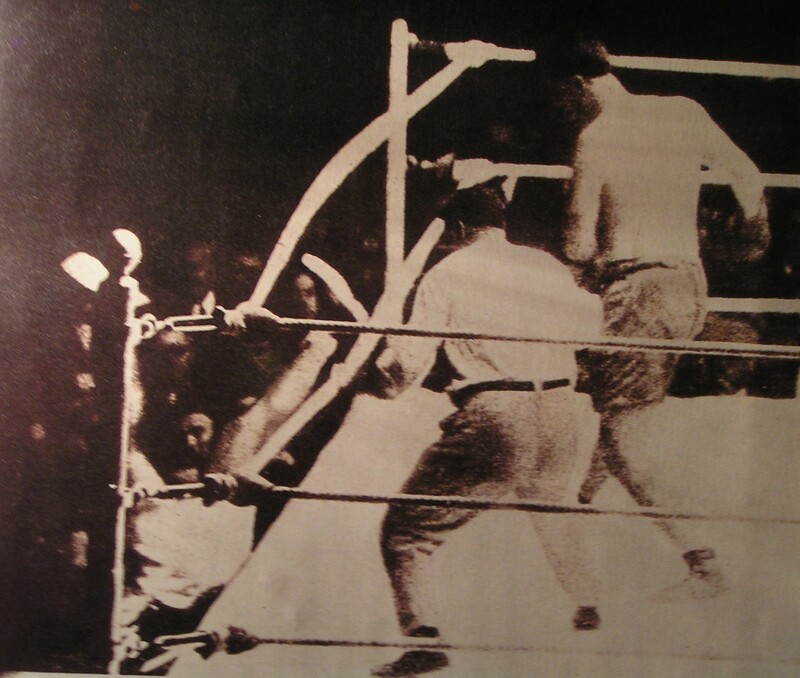 In the first round, Dempsey knocked Firpo down seven times; that was made possible by the rules that prevailed at the time, permitting a boxer to stand over a floored opponent and knock him down again as soon as he got up, and also by the fact that three knockdowns in one round were not yet considered a technical knockout. A rule adopted later required a boxer to go to a neutral corner when his opponent was knocked down. Later in the first round, Firpo landed a right on Dempsey’s chin and knocked him through the ropes and into the ringside seats. What happened next generated one of those exquisite controversies that arise in sports. The sports writers sitting at ringside helped Dempsey back into the ring. Analysis of the film of the fight indicates that the referee had counted only to four when Dempsey was back on the canvas, but observers who were checking their watches claimed that as many as fourteen seconds had elapsed when Dempsey was ready to continue. Because of the count, and because Dempsey didn’t get back into the ring under his own steam, the argument arose and has persisted that Firpo should have been awarded a knockout and crowned heavyweight champion of the world. If Dempsey had been out of the ring for twenty seconds, the rule in place at the time would have resulted in a TKO. As it turned out, Dempsey knocked out Firpo in fifty-seven seconds of the second round, and Firpo never did win the title. Dempsey who was a wild and wooly character, often involved in controversy, earned enormous amounts of money as a fighter. He later operated a popular restaurant in Manhattan. Firpo became an automobile dealer and a large-scale rancher. He and Dempsey later jointly managed an Argentinian boxer named Abel Cestac who became the heavyweight champion of South America. I don’t follow boxing any more, but when I was younger I had a conflicted relationship with the sport. I enjoyed its history, its characters, and its ritual, and I admired boxers such as Archie Moore, Carmen Basilio, Rocky Marciano, Ray Robinson, and Floyd Patterson. On the other hand, I thought, and still do, that boxing is fundamentally barbaric. Boxing was a subject that interested George Bellows, who did a number of works that portrayed amateur fights. He may be best known for his scenes of New York City life. He promoted American intervention in World War I and the war, including atrocities attributed to German troops, provided him with some riveting subject matter. When he was criticized for painting images of a war he did not witness, he asked rhetorically if Leonardo had attended The Last Supper. Bellows certainly had a good comeback, about Leonardo and the Last Supper. It’s interesting that I know every name you mentioned, but I can’t remember watching more than a glimpse of a fight, on television. It suppose it’s a testament to how important boxing was a few decades ago: a different sport for a different time. There was a time during my childhood when my dad made a few work-related trips to New York. I’m just sure Dempsey’s was one restaurant where he dined. Dempsey was at that restaurant every night, greeting the guests. Charles Hamilton, who was an authority on handwriting, told me that partly because of that restaurant, Dempsey sharply reduced the value of his autograph. That value, Charles said, has more to do with how many times a person signs his name than it has to do with who he is. Coincidentally, John Edward Kelly, a 19th century boxer who was middleweight champion of the world for more than six years, adopted the pseudonym Jack Dempsey. 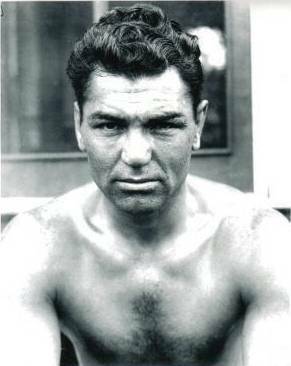 No one knows why he didn’t use his own name or why he chose Jack Dempsey as an alias. He was known as “the nonpareil,” meaning that he had no equals. While that was an obvious exaggeration, he is regarded, as the boxing jargon goes, as “pound for pound” one of the greatest fighters in history.